The sounds of blues and the slow movement of floating fish looking for food at the bottom of an artificial "ocean" - what could be more soothing, bringing "calm", giving a sense of harmony? 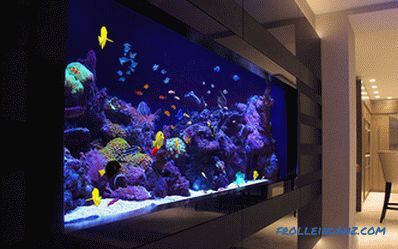 Although a detached aquarium is impressive and mesmerizing, with the built-in it, of course, can not be compared. The latter offers much more space for big fish and beautiful water landscapes. There are many ways to use the aquarium in the interior of an apartment or house, both for practical purposes and exclusively for pure aesthetics. In the kitchen of this Florida home, ingeniously named by Nemo designers (NeMo by New Modern), you can see the best kitchen apron which only imaginable. An aquarium mounted in a stone wall shines with an intense blue color, demonstrating a magnificent water landscape. This, of course, is not as practical as tile, but it definitely surpasses the latter in terms of aesthetics. In addition, it is a great way to compensate for the lack of windows in the kitchen. NeMo by Phil Kean Designs. If you have a small place, a large aquarium can remain a dream. 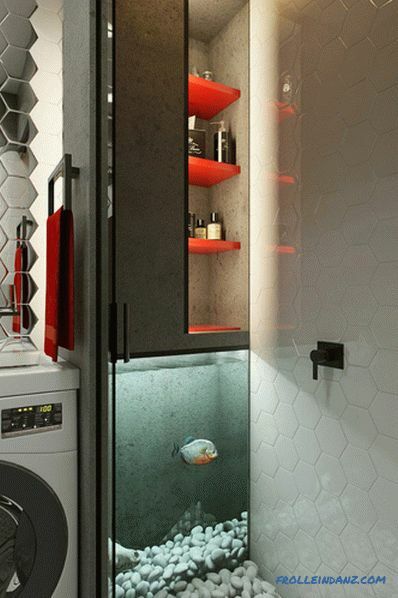 Although One Studio has developed the concept of a tiny apartment (36 square meters) with an aquarium, and you can use this idea if you wish. The space of this dwelling is carefully thought out, as a result, the aquarium was placed in the bathroom, under the cabinets. An aquarium in the interior of a small bathroom is perhaps one of the most unusual ideas we have seen so far. A tiny apartment in Kharkov. Do these aquariums seem a bit boring to you? How about a “tape” aquarium that stretches and stretches from wall to wall? Such "water strips" look great in any room. Moreover, due to their size, they will be able to decorate at the same time several zones in open plan houses. White neutral walls are ideal as a frame for such an aquarium, but black will also work well. A calm modern interior from Discus Fish Tank. The interior of Notting Hill Residence in London was designed by the design company Staffan Tollgard Design Group. 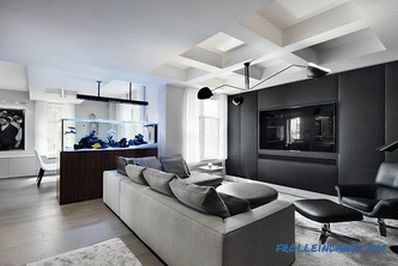 The most interesting design solution in this interior, of course, is an impressive aquarium located in the wall storage system. If there is a better way to transform this huge built-in wardrobe, we have not yet found it. Notting Hill from the Staffan Tollgard Design Group. 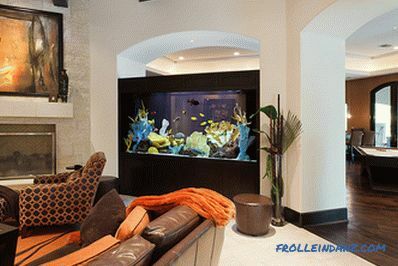 The narrow aquarium from Aquarium Architecture extends from wall to wall and becomes the focal point of the room. The perfect accent for a modern house, decorated in a minimalist style. A wall-mounted aquarium in the River View. This house in Chicago, designed by Dirk Denison Architects, boasts not one, but two aquariums. They are built into the wall and only slightly come forward. Reviving the room with their beautiful landscapes, these aquariums look boldly against the background of a neutral color scheme of the interior. One of the Chicago houses from Dirk Denison Architects. Aquariums are most often rectangular, but custom-made designs can be more flexible in terms of shape. For example, this aquarium from Aquarium Architecture has rounded corners and looks a little different than ordinary aquariums. In addition to these "oval" often there are also hexagonal aquariums, but usually they are in the form of separate objects, rather than built-in ones. Aquarium Architecture Aquarium in a house in Oxford (United Kingdom). Aquariums that divide a room are not a new concept, but it is great in many ways. Due to its transparency, the aquarium as a partition in the interior of the house with an open layout is just perfect, because it adds a sense of privacy, while keeping the space bright and spacious. The Rockwood Manor in Connecticut is stunning with a view from here to Rockwood Lake of the same name. Designers from the company Wadia Associates decided to strengthen the impression by installing a huge aquarium-sharing room here. His beauty can be enjoyed being in both parts of the room he shares. And transparent glass walls allow natural light to "travel" around the house. 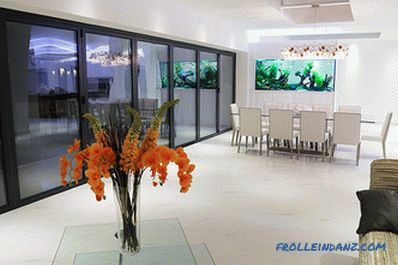 A huge aquarium separating the dining room from the kitchen. Manor Rockwood in American Greenwich. This aquarium, which separates the two parts of the office, is simpler, but no less beautiful. Filled with purple and green plants, it adds bright accents to the modern interior. 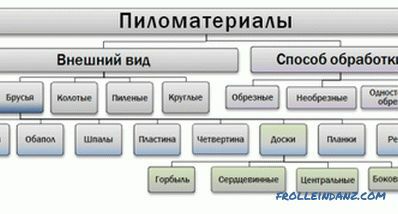 The partition itself is small in size, which in a small room only increases its value. Agree, not every office can boast of such an addition to the interior. Aquarium sharing a room from Aquarium Group. The aquarium from the Okeanos Group does not extend to the ceiling itself, but at the same time perfectly zoning the space, separating the living room from the dining room. The blue water landscape harmonizes well with the neutral black and white palette of the room, bringing a much-needed splash of color into the interior. Aquarium from the Okeanos Group. A similar aquarium divider makes you feel at the bottom of the sea or at least in the aquarium. Its perfect location divides the open-plan area into zones, adding a delightful design element to each one. 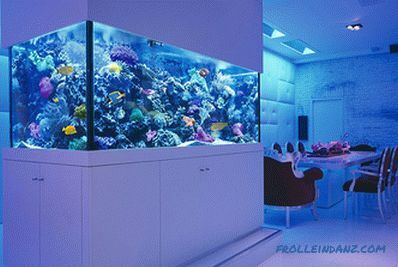 A luxurious aquarium in a luxurious home. A private house in Italy, located on the banks of the pond, designed by Persico Studio, boasts a beautiful aquarium that separates the kitchen and the dining room and, no doubt, revives them. House with an aquarium in Italian Kashin from Persico Studio. 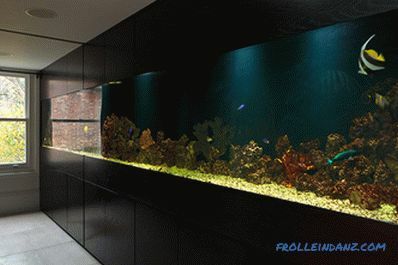 This incredible freshwater aquarium from Aquarium Architecture is also essentially a room divider. It separates the dining room from the rear glass staircase. 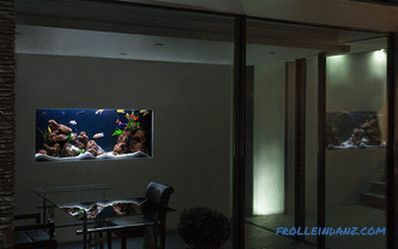 The aquarium fits perfectly into the interior of the room, and its water landscape looks like a work of art on the wall. 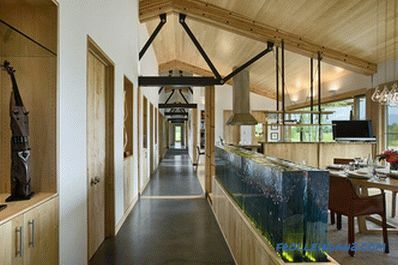 Freshwater aquarium from Aquarium Architecture. The reef marine aquarium from the Okeanos Group is incredible. 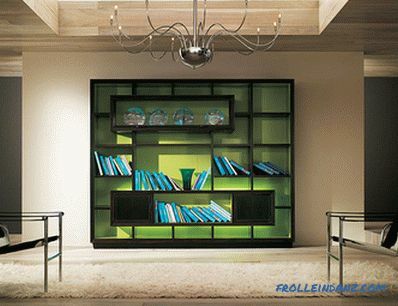 It does not just divide the room: there is also a functional storage space under the impressive aquarium. Of course, an aquarium with a simpler water landscape will cost you less, but reef is one of the most scenic ones you've ever seen. With such an aquarium, the type of room no longer matters. A reef marine aquarium from the Okeanos Group. The partition dividing the room benefits greatly from the aquarium built into it. 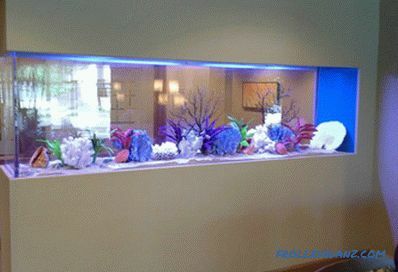 Specialists from Clayton Aquariums have integrated this relatively small, but producing effect aquarium into the partition, due to which the second part of the room becomes visible. This can significantly transform your interior. We will not even talk about the fact that you thus bring a piece of nature into your house. 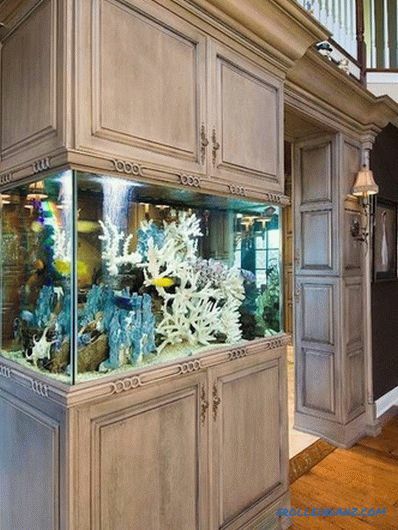 A built-in aquarium from Clayton Aquariums. If you have the opportunity to use your aquarium as a space divider, for example, two rooms, then there is no better way to show it in all its glory (and at the same time save space). One of the aquariums presented on the Design Rulz website actually uses the existing open arch, while the other, separating the dining room from the living room, is built into a large, wooden wardrobe right up to the ceiling. A large aquarium in the arch. 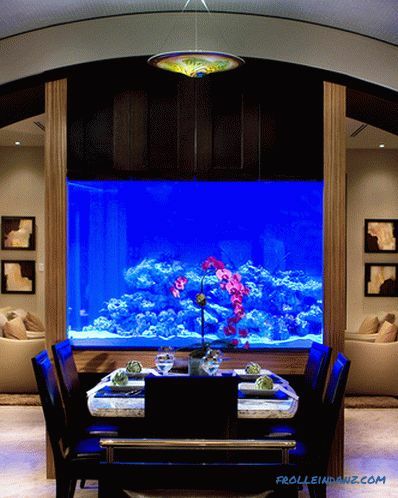 An aquarium used to separate the dining room from the living room. 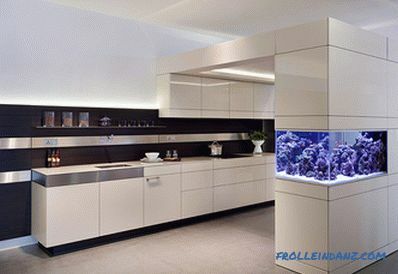 Another example shows a pair of upper and lower cabinets with an aquarium in between. This design is used to separate the kitchen from the hallway or living room. Built-in closet aquarium, zoning room. 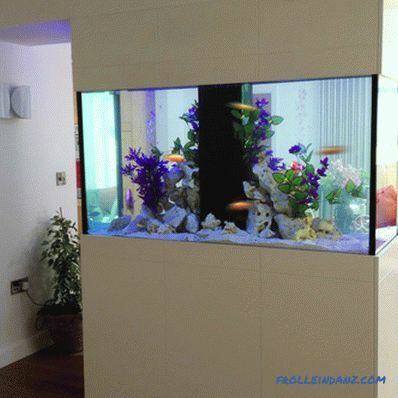 Aquariums built into the wall are very popular today. They can be integrated into almost any room, including the kitchen and dining room. At Milan Residence, you will find a variety of glass interior elements and eye-catching objects, such as a black piano or a cowhide-covered chaise longue. The aquarium built into the wall is on the list of spectacular details of this modern home. Aquarium in a modern interior. 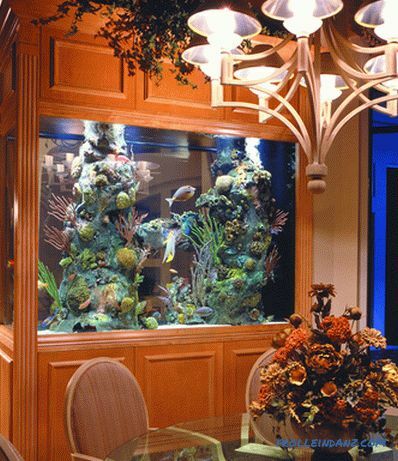 Aquarium Architecture has created the ability to embed this amazing addition to a small dining room wall. The aquarium, though small, does not make it any less impressive. Built-in backlight gives a soft glow, so it can serve as a night light. A freshwater aquarium at Nettleton Villa. 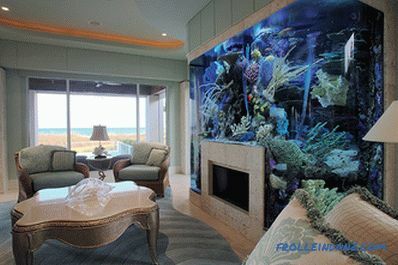 Aquarium Architecture creates artificial mini-oceans for any room — from the kitchen to the entrance hall. 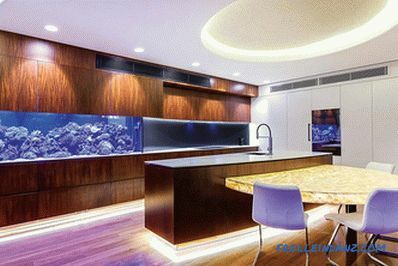 For example, in the Richmond Residence, a built-in aquarium was installed in the kitchen, resembling a huge flat-screen TV, which makes the room more alive. Architectural Aquariums are something different from all that we have already seen. Being an integral part of the building structure, they seem to us come from another world. The successfully named "Villa with an Aquarium" was created by the Centric Design Group and is located in the Netherlands. 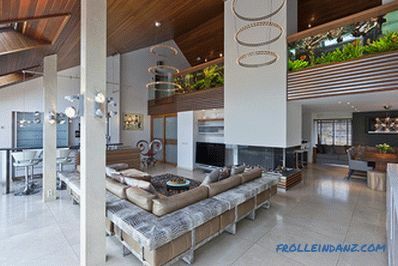 Aquariums, which serve as fencing on the mezzanine floor, make the interior of the house completely unique. 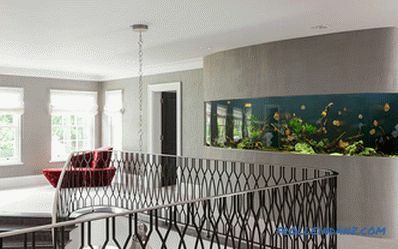 Each of those on the lower floor can simply raise their heads to look at the fish swimming above their heads.What a great alternative to ordinary railing! A glass fireplace on the first floor echoes the aquarium and makes the space bright and airy. 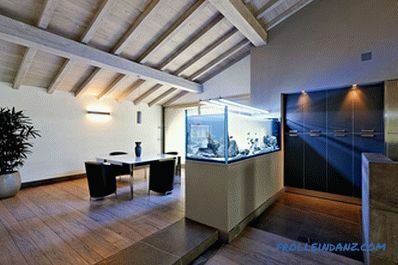 Villa with aquarium from Centric Design Group. The design of the EHA Family Trust Residence in Wyoming, designed by Ward + Blake Architects, was completed in 2011 with the installation of a stunning open-air aquarium. The latter plays the role of a partition between the dining room and the hallway leading to the other rooms. EHA Family Trust Residence by Ward + Blake Architects. An aquarium with salt or fresh water can be a great addition to the interior of any room, regardless of its size. The main thing that is required of you is the desire to bring into your home a bit of exotic. 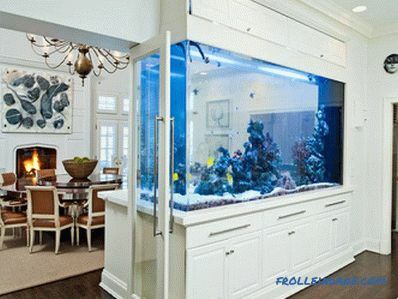 Obviously, the larger the aquarium, the more it will affect the look of the room. 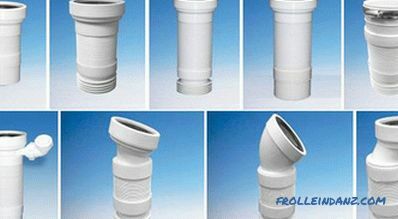 You can purchase a pedestal stand specifically designed for a container containing tens or hundreds of liters of water. 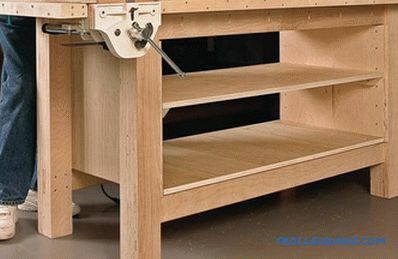 However, it should be taken into account that such cabinets are rather bulky and often take up too much space. 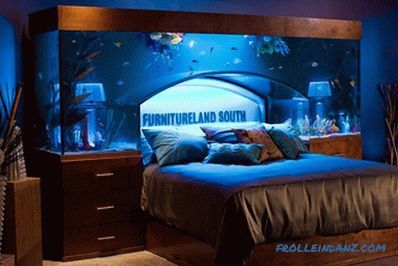 So why not build an aquarium in your furniture or even in the walls of your house? Here are some interesting ideas that will surely inspire you! 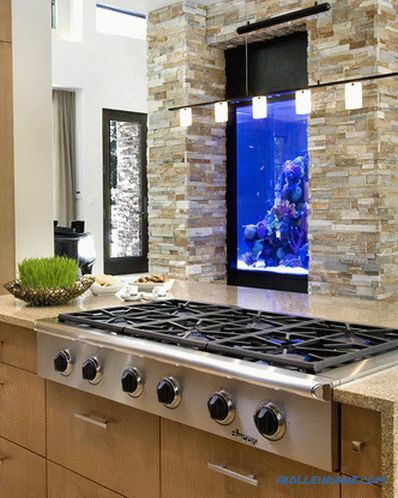 Placing aquariums in the kitchen has become a trend in recent times. 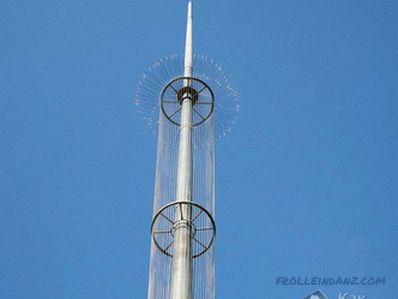 And some bold ideas and concepts came to the head of some designers. 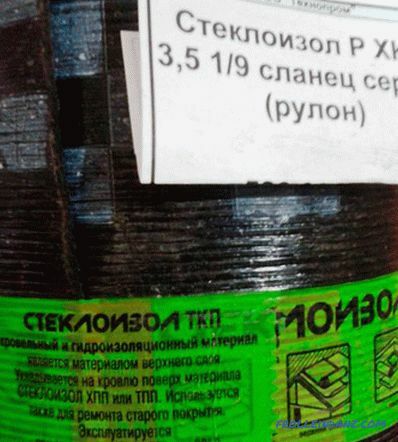 Take, for example, Robert Kolenik and his project Ocean Kitchen, which made a lot of noise a few years ago. This incredible island kitchen table is not only practical, but also beautiful, because it is an aquarium table. What competent use of space! Agree that the kitchen on which such a huge island table is placed, including a spacious aquarium, hardly requires anything else in terms of decor. Feeding fish may seem difficult, but in fact the tabletop rises by simply pressing a button, which provides access for all the necessary manipulations. In a similar example shown on the Piatti website, the aquarium is smaller. He does not occupy the whole island table, but still gorgeous. 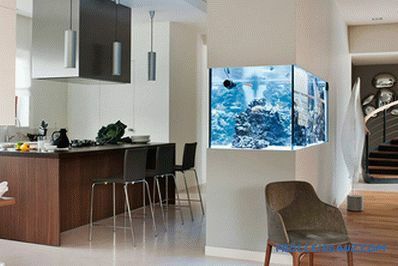 An aquarium built into the kitchen island table. 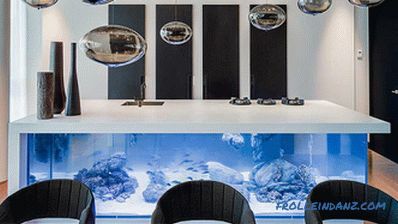 Aquafront had an excellent minimalist kitchen concept with a reef aquarium embedded in the furniture. Playing with contrast, the designers emphasized the beauty of the purple reefs. In the background, everything looks as practical as in a regular kitchen. As if supporting the general concept of a "floating" kitchen, a thinnest stainless steel shelf for dishes and spices (or, maybe, jars of food for fish?) Soars along the far wall. Kitchen design developed by Aquafront. Mark Gaches, while designing the kitchen design at Central Beach House, decided to install a blue aquarium mounted in a wooden cabinet, which stands out with a beautiful water landscape. Recessed lighting focuses on every element of the interior, including a stone countertop and an island dining table. The design of the kitchen by Mark Gaches. The Mood Works' Tamed Nature project provides an amazing piece of detail — a magnificent reef aquarium built into the wall. It contrasts strongly with the minimalist design of the kitchen, but at the same time supports the given concept. "Tame nature" from Mood Works. Kitchen cabinets often stretch from floor to ceiling, leaving free space in the middle for countertops. 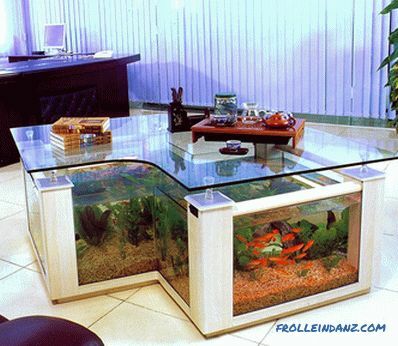 If you can afford to donate a piece of work surface, why not use it to place your aquarium there? 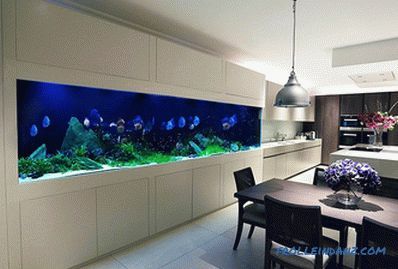 This aquarium, built into the kitchen furniture, leaves a small section of the tabletop free to eat. 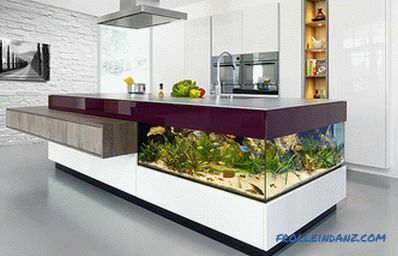 An aquarium that is built into the kitchen and occupies part of the worktop. If you find kitchen island tables with built-in aquariums elegant, you should like the idea of ​​using coffee tables for this purpose. The company 4 Fish Tank produces and sells such magnificent tables of various shapes, sizes and styles. Their tabletops are made of glass so you can enjoy watching the fish! 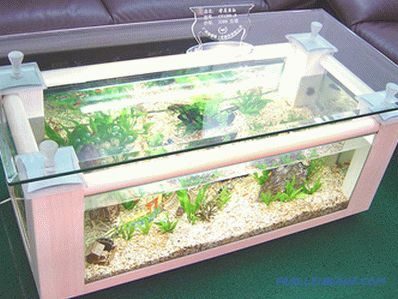 A large coffee table with a built-in aquarium. 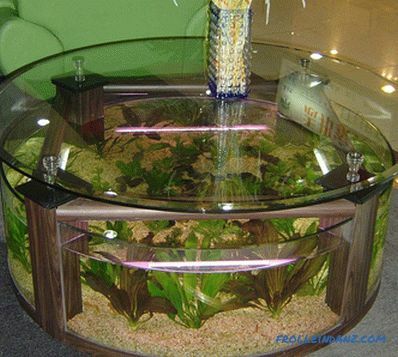 Round coffee table with an aquarium. There are many different ways to decorate a boring-looking fireplace, but perhaps the most creative of them are with an aquarium. Only if you decide to put this idea into practice, do not forget to monitor the water temperature every time you kindle a fire. A step higher - a massive aquarium, presented on the website If It's Hip It's Here.It completely surrounds the fireplace in the living room or lobby, most likely in some luxury hotel. Can you imagine something as unique in your home? A fireplace and an aquarium in the living room interior. Who needs a headboard, if instead of her in the bedroom there is a huge aquarium? 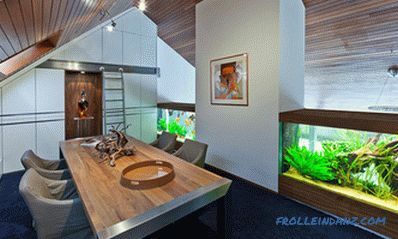 This hotel room, presented as an example on the website Real House Design, literally allows you to sleep with fish. 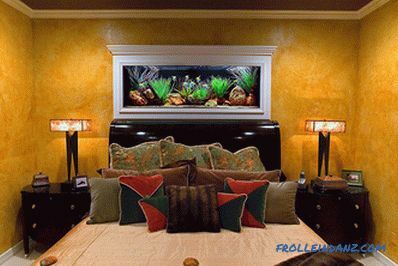 If it is too big for you, you can save your headboard and install a smaller aquarium comparable in size to the picture. 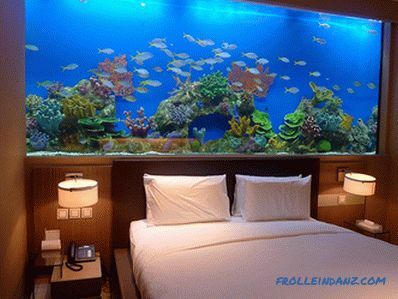 A huge aquarium takes up space at the head of the bed. A small but elegant aquarium above the bed. Acrylic Tank Manufacturing created the best headboard you can imagine for a bed. With its unusual shape, this aquarium can definitely make a person believe that he or she is one of the sea creatures dormant on the ocean floor. The designers made two nightlights a part of the water landscape, but in practice they turned out to be of low functionality, therefore instead of them a luminous illumination is used. If you feel the creative potential, you can set a unique one Aquarium built into the furniture. For example, right in the middle of this modern rack there is space for an aquarium. Aquarium built into the shelving. Here's what you could hardly see - a floor clock with a very modern design. Basically it is water and fish. If the fish knew how to talk, they would tell you about it every time you were late to feed them. 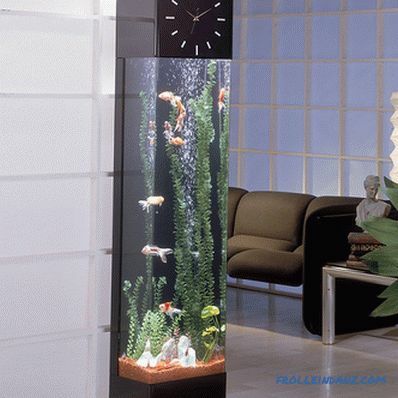 A floor clock with a vertical aquarium. 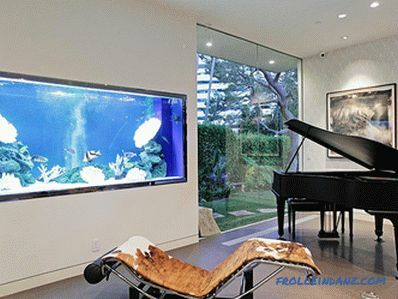 If you no longer need the old piano, consider pulling out all the strings and turning the upper part into an aquarium, as in the example provided on the Buzz Buzz Home website. It looks much more elegant and interesting than the usual stand for the aquarium. 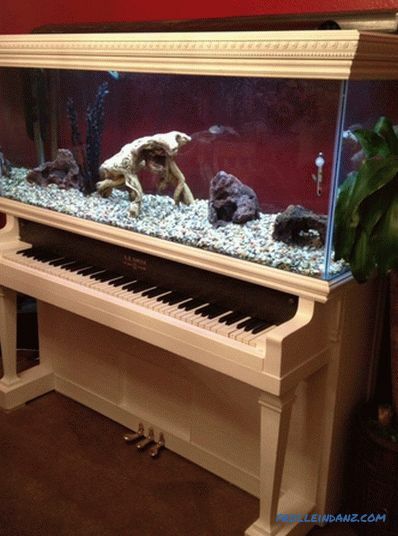 An aquarium built into a white piano. Built-in aquariums require not only careful planning, but also complex maintenance. But if their soothing blue glow and light movement will help you relax and unwind at the end of a long day, then it's worth it.